In terms of his achievement there is only one other composer to whom Franz Schubert can be compared: Mozart. Perhaps not as precocious as Mozart, Schubert was nonetheless already an accomplished composer as a teenager. In his brief thirty-one years, he created a life’s work of more than one thousand compositions, which include sublime masterpieces in almost every musical form. Like Mozart, Schubert had an almost spontaneous gift for music. It flowed out of him in a profusion of incomparable melodies that it is hard to believe one human being could have produced. As the principal music teacher at the Imperial and Royal Seminary, where young Schubert studied exclaimed, “This one’s learned from God.” Schubert had a preternatural gift, the only other composer so blessed besides Mozart. Yet there the similarities end. Mozart’s music has a preternatural purity and perfection that somehow escaped the mark of original sin. It is both a sign of life before the Fall and a promise of Paradise. Schubert’s music communicates from the near side of that catastrophic divide. It is the music of Paradise lost. It is the songful lament of the wanderer who has been banished, yet who must find the difficult way back through suffering and death. It is music of the journey in exile. As Schubert said of himself, “I arrived a stranger, a stranger I depart.” The departure is, of course, death. In a way, Schubert’s work is a musical echo of St. Augustine’s famous cri de coeur: “Oh Lord, thou hast made us for Thyself, and our hearts are restless until they rest in Thee.” Schubert said, “It sometimes seems to me as if I did not belong to this world at all.” He didn’t. Neither do we. This is the ultimate perspective within which to hear and understand Schubert’s music and message. That message is delivered with a directness unique in the Classical era, which has led some critics to classify Schubert as an early Romantic. While his language is Classical, Schubert’s innovations in form (or, as some might say, his loosening of form) are dictated by his urgent, expressive needs. The abrupt shifts between major and minor modes and his harmonic adventuring all help to communicate the emotional freight of his message. “I pass it on as it comes from my heart,” he wrote. With Mozart one must first get past the perfection to feel the poignancy. With Schubert the poignancy is up front, seemingly unadorned. Schubert forthrightly expresses emotion in some of the most intimate, confessional music ever written. No composer has detailed man’s inner life more finely or explored the world of suffering more thoroughly than he. Schubert revealed the key to that inner life in an allegorical story he wrote in his diary in 1823: “when I wished to sing of love it turned to sorrow, and when I wanted to sing of sorrow it was transformed for me into love.” He developed this same theme in his favorite opera, Alfonso und Estrella, written the year before. In it, the hero and heroine sing, “only a loving heart knows the secret beauty in the human soul; through the power of love, joy, and sorrow are wedded.” This is not only psychologically sound, it is profoundly Christian because it is the message of the Cross. In fact, the whole opera is profoundly Christian. In it, an exiled king is reconciled with his usurper because the king is able to forgive. It is his forgiveness that induces repentance on the part of the usurper. This is the true action of grace: Forgiveness makes repentance possible. One is not forgiven because one repents. Rather one is able to repent because one is already forgiven. Mercy is all. The exiled King Troila proclaims that, “The finest victory is to forgive one’s enemy.” In turn, the usurper Mauregato forgives his treacherous general, Adolfo, Who exclaims: “How can I endure this grace?” The answer is: only by responding to it. Adolfo then swears undying fealty. And King Troila announces, “Mercy redeems our guilt.” The opera ends with redemption for all, with the role of providence revealed. As one might deduce from this opera, Schubert was a deeply pious man. He wrote a significant number of religious works, including six Latin Masses. But Schubert’s faith was somewhat unorthodox. In each of the Masses he deleted “unam sanctam catholicam et apostolicam Ecclesiam” from the Credo. No one really knows why. Could it have been from a streak of anti-clericalism, such as is often found in all-Catholic countries? It is all the more puzzling since the deletion made the Masses unsuitable for church performance until the words were restored. After listening to the Masses, one can have no doubt that Schubert believed with his heart and soul. The early Masses, written in Schubert’s teenage years, may be indebted to Haydn and Beethoven, but they are no mere apprentice works. They have an engagingly naive charm of their own. They are youth’s sweet testaments to faith. Conductor Nikolaus Harnoncourt thinks that the last three Masses are the “greatest, most important and artistically significant attempts to come to terms with the Christian liturgy.” This is especially true of the last two, the Missa solemnis in A-flat major and the Mass, No. 6 in E-flat major. Here are two undisputed masterpieces, the foundation of a tradition from which Anton Bruckner would later draw to create his great Masses. While Schubert observes the basic conventions in these Masses, there is nothing formulaic or dull in them. They are highly original. As one might imagine from his text deletions, Schubert’s approach to the Mass is not rigidly doctrinal. He seems more concerned with recreating the experiences the doctrines define: the awe, the mystery, the veneration, the devastating sorrow, the sublime elevation, and the ultimate joy. This is why his response to the words is so individual and vibrant. The last Masses seem more a personal response to the liturgical drama than a formal liturgy. 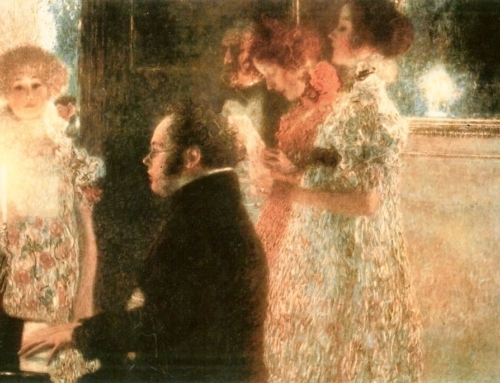 As Schubert said of his religious compositions, “I never force devotion upon myself and, except when involuntarily overwhelmed by it, never compose hymns or prayers of this kind, but then it is usually the right and true devotion.” Right and true devotion is what one senses here in an overwhelming way. The works through which I first grew to love Schubert were those last to be accepted into the canon—his piano sonatas. The performances, available from Deutsche Grammophon, are by Wilhelm Kempff. Time and again, Kempff communicates the sense that this music is a kind of code for the deepest emotional experiences man can have. Kempff amply vindicates his claim that he is “raising hidden treasures from the immeasurable depths of Schubert’s musical soul.” That experience was replicated when I explored the late chamber music (the great “Quintet in C major,” the joyous piano trios, the “Trout Quintet,” the “Octet for Winds” and the last several string quartets) and then the mature symphonies. Only lately have I been brought to the glories of the Masses, the lieder (to which Schubert made the greatest contribution of any composer), and his few available operas. Each reader will have his or her own journey through these treasures. In what was nearly his last song, “Der Hirst auf dem Felsen,” Schubert delivered a final farewell. The singer sings into the dark depths of the valley which echo back to him his own words: “I am consumed by deep sorrow,/ My joy has gone./ My hope on this earth has vanished;/ I am so alone here.” As the song resounds, “It drew hearts heavenward with its wondrous power.” And so it, and the rest of the sublime legacy of this unique genius, still does. Republished with gracious permission of Crisis Magazine (September 1997).